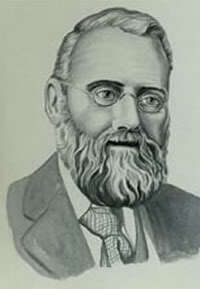 The electorate of Farrer was named after William James Farrer, a distinguished agriculturalist who was the father of the Australian wheat industry. Born in Docker, Westmorland, England, April 3, 1845, Farrer died on the 16th April 1906. Awarded a scholarship to Christs’ Hospital, London, he won gold and silver medals for mathematics before continuing his education at the University of Cambridge (BA 1868). Arriving in Australia in 1870, he worked as a tutor at George Campbell’s sheep station, Duntroon (Canberra) and then qualified as a surveyor in New South Wales in 1875, working for the Department of Lands in the Dubbo, Nyngan, Cobar and Cooma districts between 1875-86. In 1886 Farrer purchased “Lambrigg” on the Murrumbidgee River near where Canberra now stands and began private experiments on cross-breeding wheat from 1889. He was further employed as a wheat experimentalist for the Department of Agriculture in 1898. His best known wheat was ‘Federation’, which became the leading variety throughout Australia between 1910-25. His success was demonstrated in 1914, when of the 29 wheat varieties recommended for growing in New South Wales, 22 had been developed by him. His wheats were not so much rust-resistant as rust escaping because of their early maturity. ‘Federation’ was developed especially to tolerate Australia’s harsh climate, and was capable of withstanding diseases such as rust, while producing high yields. Apart from having a Federal electorate named after him, William Farrer was also commemorated through the Farrer Memorial Medal for outstanding achievements in agricultural science, research and education and the Farrer Memorial Scholarship for postgraduate agricultural research. He also appeared on the first decimal $2 note, and is recognised on a variety of memorials, on stamps and as the namesake of schools, streets, institutions, a flour mill and a suburb in Canberra. Covering almost 126 590 square kilometers Farrer is bordered by the states of Victoria and South Australia. Central to the life of this rural NSW electorate are the mighty Murray, Murrumbidgee and Darling inland rivers. Following a redistribution at the 2016 Federal election Farrer becomes the “home” of irrigated agriculture, with more than half of Australia’s agricultural production (in 2012-13) coming from the southern Murray Darling Basin. The Murray River and its tributaries form Farrer’s southern boundary and are the lifeblood of the local government areas of Albury, Berrigan, Edward River, Federation, Greater Hume, Murray River and Wentworth. The mighty Murrumbidgee River defines the shires of Balranald, Carrathool, Murrumbidgee, Hay, Griffith, Leeton and Narrandera. More than 114,000 constituents and their families call Farrer home, with a large rural population working the land and vibrant Albury and Griffith as regional city hubs. Farrer incorporates many industries including large-scale irrigation areas producing rice, grapes, cotton, irrigated cereals, dairy, wool, fat lambs and cattle as well as citrus, horticulture and vegetables. With its primary production and significant value add in cotton, rice, wine, chicken and nut processing, the region is the nation’s premier food-bowl and plays a significant role in exporting some of Australia’s best produce. The region’s economy is underpinned by a thriving agricultural sector and innovative and resilient small businesses. A wide variety of employment opportunities also exist in the public and private sectors, rural and regional industries and education and health fields. Mining, tourism and hospitality are newer. The region is an increasingly popular tourist destination with many wonderful towns and regions which are rich in culture and arts. There is also a strong indigenous history associated with the Wiradjuri people calling much of the electorate home for thousands of years. In addition, the oldest human remains ever found in Australia were found at Lake Mungo, in the world heritage Willandra Lakes. Significant natural sites such as the Barmah Millewa Forest, the Pericoota wetlands, Yanga Lakes and Nimmie Caira underpin the significance of the modern management of our rivers, to support both agriculture and the environment. The electorate of Farrer is bounded by the NSW federal electorates of Parkes and Riverina to the north and Eden-Monaro to the east. The Murray River separates Farrer from Victorian electorates of Indi, Murray and Mallee to the south, while across the western boundary and NSW-South Australia state border is the electorate of Grey. There are three levels of Government in Australia – local, state and federal. Use this locator to find out which local government area and state division you belong to within Farrer.